The demand for surgical services is growing rapidly, especially with ambulatory and cosmetic procedures. During the last decade, the volume of ambulatory surgery in U.S. hospitals increased by 2.9 million procedures, according to data from the American Hospital Association. As one of the busiest areas in a hospital, perioperative services often contribute 40 percent or more to the hospital’s overall revenue. Amazing clinical and technical advances are transforming the way surgeries are performed. To attract both patients and physicians, some hospitals are introducing digital (paperless, wireless, filmless) operating rooms, telesurgery and robotic assistants. New minimally invasive and image-guided surgical techniques offer many patients shorter hospital stays, less pain, faster recovery and fewer complications. In spite of such advances, challenges remain to ensure patient safety, reduce expenses and streamline workflow. A recent study from the Healthcare Financial Management Association (HFMA) and the Health Care Advisory Board found that the average operating room runs at only 68 percent capacity. The report also indicated that improvements targeting even one procedure per day per operating room (OR) suite could translate to an additional $4 million to $7 million in annual revenue for the average-sized organization. A number of hospitals and health systems are finding that Six Sigma is a useful tool for improving quality, throughput and the bottom line in the operating room. Delays in first case starts present problems for many healthcare organizations and tend to produce a domino effect on the rest of the schedule. A variety of factors may impact the average operating room turnover time (from the time one patient leaves the room until the next patient enters). Admitting procedures, scheduling conflicts and procedures for patient preparation are all examples of the various factors that can influence OR utilization and throughput. Within many hospitals and surgical units, process variability may contribute to inefficiency and waste. In fact, room for improvement can be identified in nearly every setting – whether the facility is an academic medical center, a small/rural hospital or a large multi-hospital system. For the surgical suite to consistently deliver safe, cost-effective and profitable services, attention must be paid to both technical and cultural improvement strategies that can be maintained long-term. Quality also is a constant concern. 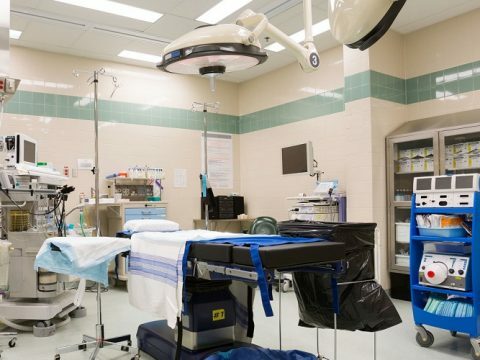 While hospitals try to take reasonable precautions to avoid mistakes, the very nature of the surgical suite makes it a unique environment susceptible to variation and error. Six Sigma can help to reduce this variability and ensure that services are delivered in the safest possible manner. From the perspective of the patient and family entering the hospital, surgery (whether same-day or overnight stay) is a stressful ordeal. Sensitive, responsive staff and the appearance of a calm, well-organized atmosphere can help to put them at ease. Room utilization: 7:30 a.m.-3:15 p.m. While peace and quiet are among the factors influencing patient satisfaction, timeliness is of great concern to surgeons. If a physician is scheduled to perform surgery at 7:30 a.m. and there are flaws in the process for admitting patients, the OR may not have the right information to proceed with the operation. If the first case starts 30 minutes or an hour late, it not only disrupts the schedule for subsequent surgeries that day, but it also may impact patients the physician scheduled for office visits later in the day. If required test results are not received in a timely fashion, this can delay or postpone the surgery. Every bottleneck or missing piece of information decreases the chance for getting patients in and out of the operating room on time. To improve throughput and create the optimal environment for surgical services, a number of critical areas must be evaluated. Operating room turnover time and case start times obviously have a major impact on costs, revenues and customer satisfaction. Ancillary areas that touch the OR such as lab, pharmacy, radiology and admitting also play a role in how smoothly the overall process flows. As part of the improvement process, it is important to examine every opportunity for increasing efficiency and achieving sustainable improvement. Instead of making assumptions regarding possible causes for bottlenecks or errors, valid data must be collected and analyzed using rigorous statistical tools. Technical strategies such as Six Sigma and Lean have been effective in this regard yielding significant cost and quality benefits. In addition, change management methods can help to achieve buy-in and build momentum for the initiative. Making the perioperative environment safer, more efficient and cost effective for both patients and providers begins by analyzing the current state and identifying the best opportunities for improvement. A project team may decide to apply Lean tools along with the Six Sigma DMAIC approach (Define, Measure, Analyze, Improve, Control). During the initial Define and Measure phases of the project, one of the typical activities is to gather voice of the customer (VOC) data by surveying. Within the perioperative setting, the customer may be any stakeholder relevant to the project, including surgeons, nurses, anesthesiologists, patients, technicians, support staff and administrators. The survey questions are generally based on a Likert scale, covering areas that are working well and those that could be improved. The data gathered becomes part of the analysis driving the direction and focus areas for the project. It is important to think about all constituents or customers who should provide input and how they relate to the continuum of care. This may include radiology, laboratory, cardiopulmonary, ambulatory surgery, admitting, recovery, medical/surgical units, intensive care units and discharge. In many hospitals, the interaction with radiology and laboratory is handled on an as-needed basis, but sometimes in larger facilities there are branches of these departments right in the OR itself. Next, the creation of a process map and sub-process map helps the team define the current process and understand all the steps or touch-points along the way. This mapping exercise will be repeated in the Improve phase to illustrate the changed process once the data analysis is done and solutions are piloted. An increasing number of patients arrive for same-day surgery. To accommodate such trends the OR has evolved into a series of care areas. Every transition point is critical and all information must be processed in an orderly and consistent manner. Throughput data is collected and analyzed to understand timing and areas of variation. This analysis is a key to finding and addressing root causes, and allows the project team to trace every step in the process and discover where there are opportunities for improvement. With the framework in place, parameters clearly delineated and the appropriate data collected, the project then moves into the Analyze phase. The team uses a variety of tools to narrow the focus and statistically validate which factors contribute most to the level of process variation. Charts and graphs illustrate current process performance relative to the upper and lower specifications that the team established during the initial phases of the project. During the Improve phase, the project team proposes potential solutions based on the evidence from data analysis. Once solutions are developed and piloted, the project is ready to move into the Control phase for ongoing monitoring and measurement. This ensures results are sustained over time. Through methods such as control charts and dashboards with key indicators, the team will know if the new process begins to show any strain and can take corrective action before the problems escalate. Definitions: Valley Baptist defined an operating room defect, unit and opportunity, and recorded the defects per million opportunities (DPMO) for three OR categories. Findings: The project team reached a couple of significant conclusions. Results: The project provided several steps forward for the hospital. Ensuring quality, efficiency and profitability in perioperative services requires a comprehensive approach and the right set of tools. Given current competitive pressures, hospitals must address inefficiencies at their source in order to optimize quality, throughput and the bottom line. The department of perioperative services must understand the linkages with the rest of the facility, and how to align its goals with organizational objectives. When processes can be tightened and delays avoided, the hospital achieves multiple and measurable benefits. Aiming for Six Sigma performance levels can help to improve cost and quality, maximize staff time and resource utilization, and raise satisfaction for both physicians and patients.